Wear out your camera at Lake Tekapo, Lake Pukaki and the Southern Alps! After a brief stopover for morning tea at the quaint rural township of Geraldine, the tour proceeds into the Southern Alps for a photo-stop at the Church of the Good Shepherd, Lake Tekapo. As the journey proceeds it follows alongside the turquoise blue of Lake Pukaki which proudly shows off New Zealand’s tallest peak, Aoraki/ Mount Cook from the many look out points around its shores. The Tasman Glacier is a side trip involving a short journey in the Maossie coach into the Tasman Valley where a small amount of walking to get the best vantage points for photography applies. Alternatively, you can elect to remain behind and spend more time at the Sir Edmund Hillary Alpine Centre, before being picked up later for return journey to Christchurch. You will really enjoy the absolutely jaw-dropping scenery on your journey from Christchurch, before arriving at your destination to enjoy an exquisitely scrumptious 5-star buffet lunch (included) at the iconic Hermitage Hotel. The newly renovated Alpine restaurant has picture-window views of the alpine Mount Cook landscapes. A unique experience at the Alpine Centre, Mt Cook - also included! The tour includes admission into the Sir Edmund Hillary Alpine Centre which contains a 3D theatre, Museum, Hillary Gallery, and digital dome Planetarium. Explore the history of the Mount Cook region through spectacular 2D & 3D experiences in the special theatre available with Japanese and Mandarin headphone translations. There are also displays showcasing transport, climbing, and of course one of the world’s greatest explorers - pioneer Sir Edmund Hillary. You will be transported to your destination in the lap of luxury. Our roomy, state-of -the-art Mercedes-Benz 519 CDI extra-long wheelbase 4WD turbocharged diesel Sprinter limousine bus with standing height inside features highly advanced technology designed to provide extremely safe, reliable and very comfortable transport in almost all conditions. Complimentary 5G Wi-Fi and USB charging. New Zealand weather especially in alpine regions can be unpredictable at any time of the year - so dress for all seasons. This is our most popular tour, so be sure to book ahead! 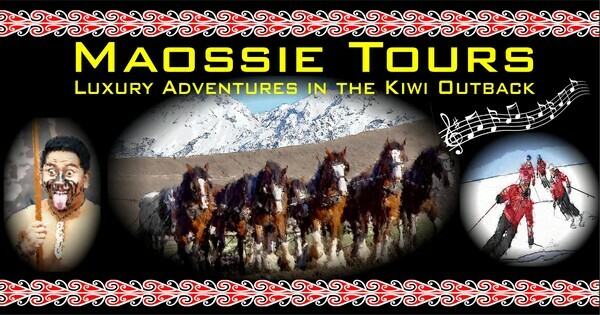 Treat yourself to the Maossie experience: book your luxury adventure today! WHAT'S ON THIS WEEK AT MAOSSIE?